Francis Sheene and Willis Rice are two of the better-known makers of what I call “workbench traps,” traps made by someone working out of his home or a small shop. Unlike most other workbench items, Sheene and Rice traps have a following among collectors of antique traps because of the quality and also the uniqueness of what they made. The large number of traps made by Rice over many years has also helped to spark interest among collectors. Francis E. Sheene, Vermontville, New York, is best known for what many collectors today refer to as the “Sheene bedspring trap.” The spring that powers the trap appears very much like the early box spring used in beds of the day. He patented the trap December 28, 1948, and it remained on the market for maybe two years, in sizes No. 1-1/2 and No. 4. I suspect the traps didn’t have sufficient holding power to match the jaw spreads, therefore, the short life spin. A single coilspring powers the No. 1-1/2. It is located under the pan, attached to the frame in front and to the lever arm in the rear. The No. 4 has two of these springs, running from lever arm to lever arm. 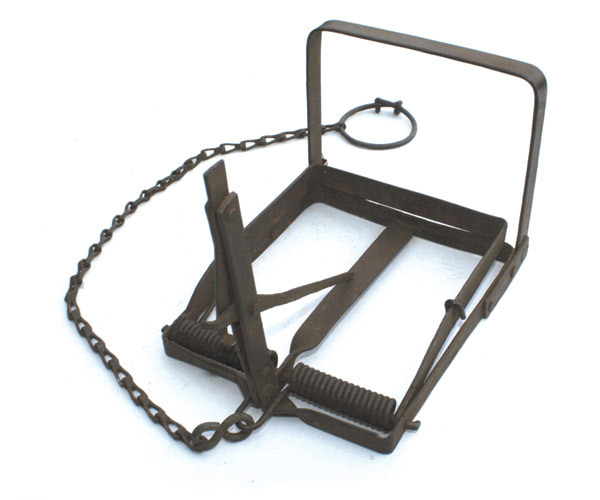 This invention relates to an animal trap of the choker type and has the provision of a trap that is reasonable in cost … that is effective in operation, and is made to guide the animal into the trap and to prevent the animal from being thrown clear of the trap when the trap jaws close. Rice also made the Kant Freeze, Two-in-One, Float Trap, Improved Conibear, Baited Trap, a wood block mouse trap, and several others of unique design. Rice could pretty much build any type of trap, and he closely duplicated many existing designs, though a collector usually can tell a Rice Trap. The Pendulum, Redford, Jackson Otter Dog, Gibbs Dope, St. Louis Killer, Gibbs Live Net and others were all duplicated by Rice. He was still making traps as recently as the late 1970s. Sheene traps in very good condition bring up to $150 on today’s collector market while Rice traps vary more in price, because there are so many. Expect to pay from $20 maybe up to $100 for a Rice trap, depending on condition and collector interest in the particular model.